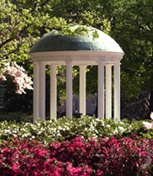 The UNC RNAi Screening Facility provides the technology for the UNC scientific community to perform cell based screens to define the contribution of each gene in the human genome to specific phenotypes. RNAi mediated inhibition of gene expression is a powerful method for identifying genes and their cognate phenotype, whose loss of expression alters the cell phenotype. Brian Golitz is the Director. RNAi Screening Facility website.